Social Security remains as vital today as it was after its 1935 passage. But advocates for the nation’s most vulnerable retirees have proposed ways to enhance their benefits. Consider the minimum benefit. Put on the books in the early 1970s, its goal was to prevent poverty among retirees who had worked for decades in low-paying jobs. The benefit’s value has diminished due to a design flaw that rendered it largely ineffective. A recent policy brief by the Center for Retirement Research analyzed various modest proposals to increase the minimum benefit and improve low-income retirees’ financial security. This brief was the last in a series on modernizing Social Security. The relatively low cost of these proposals, many of which have bipartisan support, could be offset by benefit reductions for less-vulnerable retirees. The House of Representatives is planning hearings later this year looking into ways benefits might be enhanced. With more Americans today living into their 80s and beyond, the elderly are becoming more vulnerable to slipping into poverty. 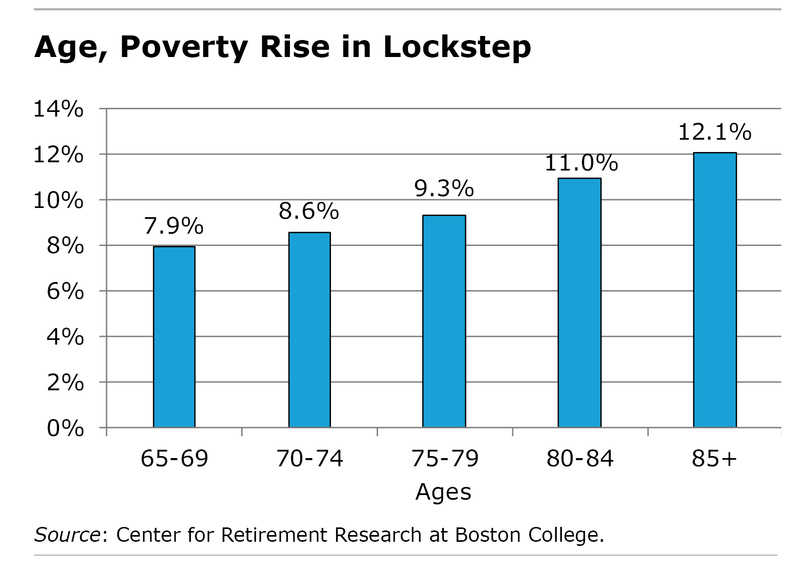 The poverty rate for people over 85 is 12 percent, compared with 8 percent for new retirees. But more elderly people may actually be living on the edge, because the income levels that define poverty for them are so low: less than $11,757 for a single person and less than $14,817 for couples. 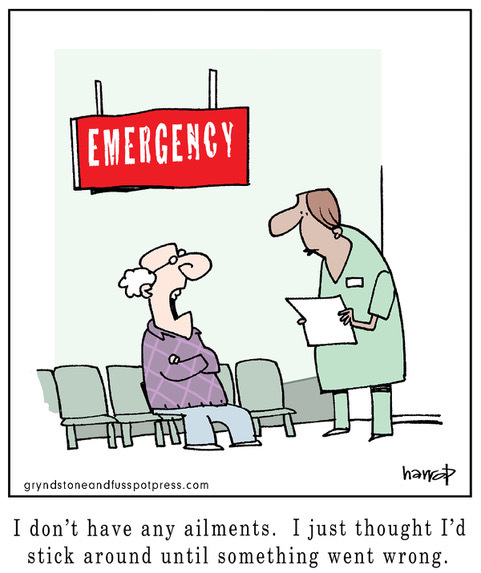 One reason the oldest retirees are especially vulnerable is that their medical expenses are rising as their health is deteriorating, yet they’re too old to defray the expense by working. This is occurring at the same time that the value of their employer pensions – if they have one – has been severely eroded by inflation after many years of retirement. 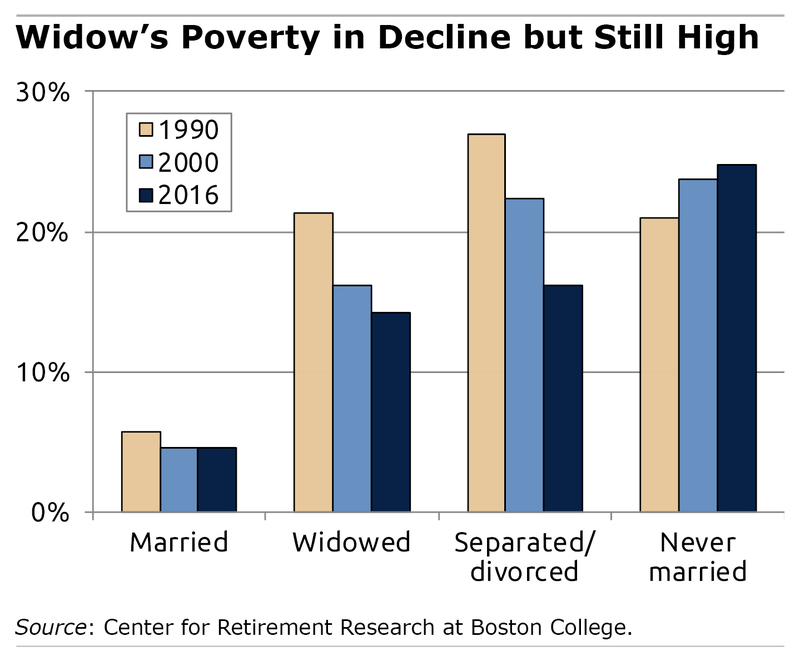 Further, elderly women are more likely to be poor than men, because wives usually outlive their husbands, which triggers a big drop in income that is generally not fully offset by a drop in their expenses. Retire in Boston or in Naples, Florida? My husband is newly retired, and we’ve spent hours talking about where we might want to live after I retire in a few years. Our imagined scenarios are always changing. But I’m clear on one thing: I do not want to buy a house in Naples, Florida, where a couple we know did recently. No offense to Naples, which has lots to recommend it – no shoveling! But the typical resident is 65 years old. In fact, Naples is older than the state of Florida, where retirement communities are so pervasive that they distinguish between the “young-old” (ages 60-75) and the “old-old” (over 75). Boston, where my husband and I live now, couldn’t be more different. It is swarming with college students and young people, including his two sons and daughter-in-law. Boston’s young people work in rapidly changing industries like high-tech or environmental engineering, and I like it that way. Boston’s median age is 32 – half of Naples. But that’s precisely what many retirees do. There are many examples of cities that have moved dramatically in the direction of one or the other extremes – Boston or Naples; Madison, Wisconsin, or Scottsdale, Arizona. The Wall Street Journal reported that new retirement communities are popping up in places that weren’t traditional resting places for snowbirds: retired baby boomers’ net migration to the Appalachian region where Georgia, North Carolina, and Tennessee converge has quadrupled since 2011. 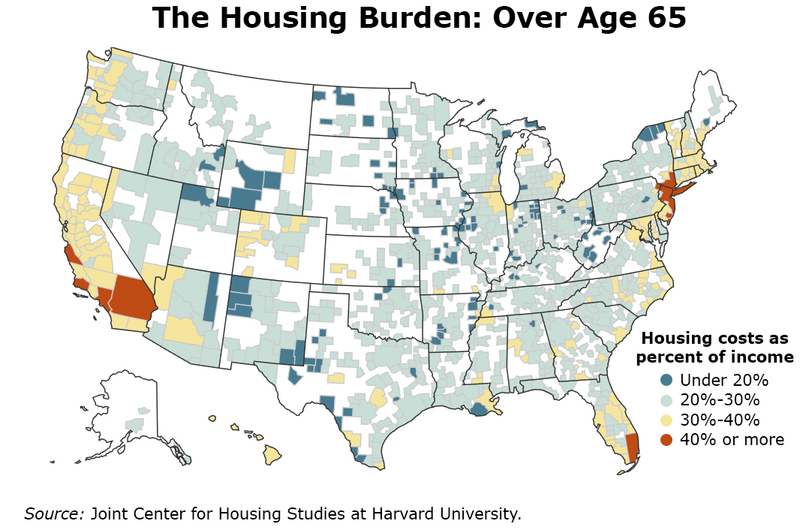 This age segregation is a relatively new area of interest to demographers. Almost 60 percent of the neighborhoods and other subdivisions within U.S. counties have moderate or high levels of segregation, which is similar in degree to the level of segregation between the U.S. Hispanic and white populations, Richelle Winkler found in a 2013 study of federal Census data. A retiree’s sources of money are often described as a three-legged stool: Social Security, pension, and savings. But many seniors’ financial support looks more like a single, sturdy pillar: Social Security. 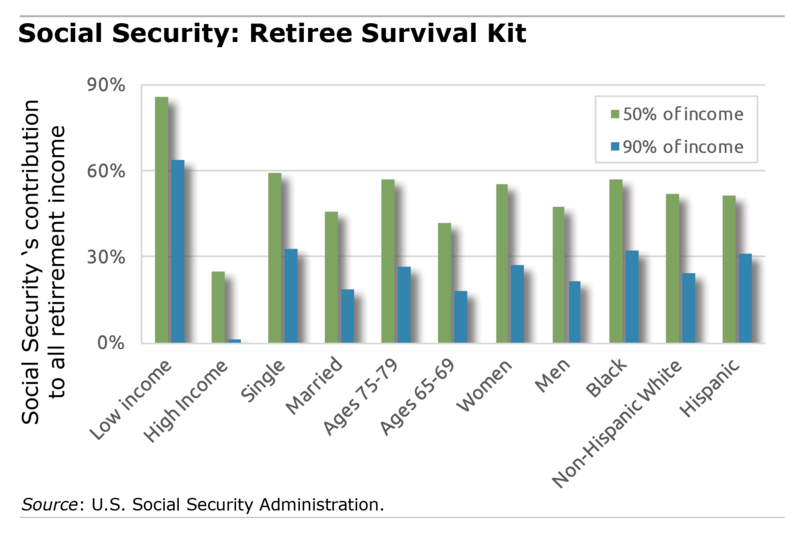 One in two retired households counts on Social Security for at least 50 percent of their total income. One in four gets virtually all income – 90 percent – from the program.